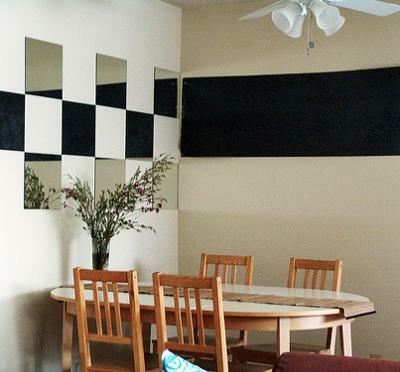 Mirror tiles are fairly cheap and certainly quite easy to use. You can add them to almost any room in the house and they will be both decorative and functional, bringing light to a dark corner. Put them near a window and from the right angle you can double the view of your garden! Whether you use them in a chequer-board pattern or just randomly on a wall, they will make a real impact. As well as the standard square mirror tiles we are all familiar with, you can now get mirror pieces cut in all sorts of shapes and sizes. A 'splash' shape isn't great for a chequer-board pattern but is fun and functional on a bathroom wall.